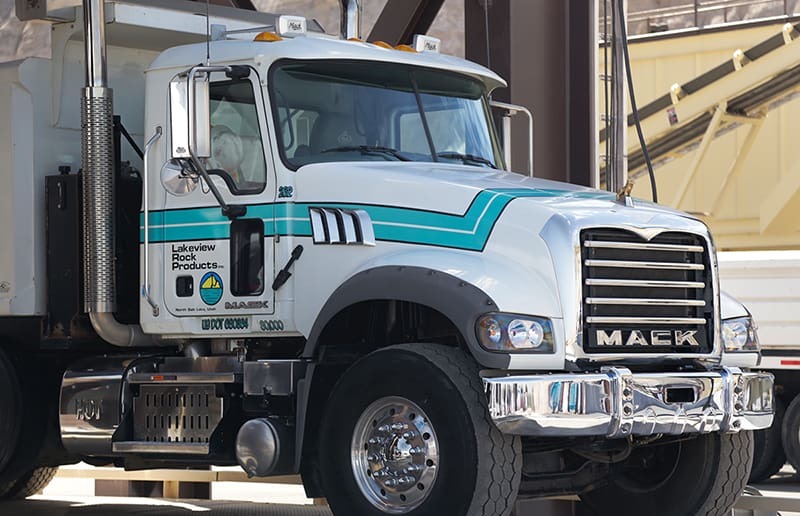 NORTH SALT LAKE, Utah — Scott Hughes, president of Lakeview Rock Products and Hughes General Contractors, has owned Mack® trucks since 1977 and says he considers Mack Trucks a crucial business partner in the company’s quest for continued ­success. Located in North Salt Lake, Utah, Hughes’ company operates a number of quarries and provides sand, gravel and aggregate materials for use in everything from roads to park trails. Hughes General Contractors serves as the building and heavy construction arm and their latest division, Lakeview Asphalt, provides hot mix asphalt to paving contractors along the Wasatch front. Hughes keeps his 14 Mack trucks working hard between the three divisions. His Mack Titans and Granite®models are spec’d from 454 to 605-horsepower, with 1,650-2,060-lb.-ft. torque and are subject to particularly harsh conditions. That’s why Hughes trusts Mack. That reliability and durability is important, and it has helped the companies develop a 90 percent repeat customer record. “People like us when we start to work for them, and they love us when we’re done,” Hughes says with a laugh. Some of their biggest projects include Legacy Parkway in Davis County, Utah, the Beck Street/I-15 widening in Salt Lake City, the YWCA Center for Families in Salt Lake City, the Salt Palace Convention Center in Salt Lake City, Palisades State Park in Sterling, Utah, Tunnel Springs Park in North Salt Lake, Utah and a ­number of schools and other education ­facilities. They are also one of only three companies in the northwest — and only 14 in the nation — certified in architectural tilt-up concrete ­construction. The family-owned company, established in 1952, has transitioned well throughout the years, always staying a step ahead of trends as well as market sentiment. During the economic downturn, they flourished due to their already lean business model. Hughes credits his local Mack dealer, Ronnie Johnson at Mountain West Truck Center, with not only sourcing the specs he needs but also keeping his trucks in good working order. Though his staff performs routine maintenance, the majority of the repairs are handled by the Mountain West Truck Center. Johnson says he works closely with Hughes to make sure he is getting the trucks he needs. And that’s exactly the way Hughes wants them. After all, his Macks are the “face” of the company. content marketing, Lakeview Rock Products, Mack Trucks, Randall-Reilly, trucking industry, Utah. Bookmark.